Imperfectly Painted: China Glaze Wood Ya Wanna? Unfortunately, I've been overall unimpressed with mainstream fall offerings this year. In fact, I've been unimpressed with their offerings all year. Come on mainstreams! I know indies are where its at. I love them too, but I started out with mainstream polishes and I'd like to see them thrive too. Wood Ya Wanna? 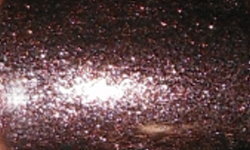 is a burgundy brown metallic foil. Color: I LOVE foil finishes. This is a beautiful fall foil. The color soft warm brown with some red/purple undertones to it and silvery foil flecks. This is just stunning. There is so much depth to this color. This reminds me of a fall sister polish to OPI Lucerne-tainly Look Marvelous which is a pewter silvery foil. I always wear OPI Lucerne on my toes in winter, and I'm now wearing Wood Ya Wanna on my toes now for fall. Awesome fall pedi color! Formula: Perfect formula. Foil finished tend to have very opaque formulas and this one definitely does. I only needed one coat! Price: This can be found at Sally's or Ulta for $7.50. Overall: I am in love with this polish. It's a brown shade like I mentioned earlier this week I've been into. Also, it's a foil finish. Lots of favorite things going on for me in Wood Ya Wanna? This is spectacular nail polish and in my opinion a must have!